Carol Black read history at Bristol University followed by a diploma in medical social work. She entered medical school as a mature student in Bristol qualifying in 1970. She trained in Bristol and soon found that Rheumatology and Connective Tissue Disorders were to become her enduring interest. Out of her clinical work sprang a research interest in Systemic Sclerosis, a disorder for which little could then be done. Her unit at the Royal Free Hospital became the major centre for clinical care and research in Europe and is internationally renowned. In 2002 Dame Carol was awarded the CBE for her work in this field and in 2005 she was awarded the DBE for her services to Medicine. In addition to being Professor of Rheumatology at Royal Free & University College Medical School, Dame Carol developed an interest in medical management and was Medical Director at the Royal Free Hospital between 2000 and 2002. 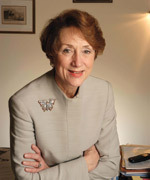 She was elected to the Council of the Royal College of Physicians in 1996 and elected Clinical Vice President in 1999. In 2002 she was elected President of the Royal College of Physicians, a post she stepped down from in 2006. Dame Carol has recently been appointed by the Government as the first National Director for Health and Work. In addition, she has been elected as Chair of the Academy of Medical Royal Colleges and appointed Chair of the Nuffield Trust. She is Co-Chair of the Department of Health Physiological Measurement Leadership Group, Chair of the UK Health Honours Committee, a member of the Council of the GMC, a member of the Secretary of State for Health’s Sounding Board, a member of the Postgraduate Medical Education Board and a member of the Board of the British Cardiovascular Society. Dame Carol has lectured extensively abroad and has a particularly fruitful clinical and research collaboration with American colleagues.